The easiest and most beneficial contribution you can make. 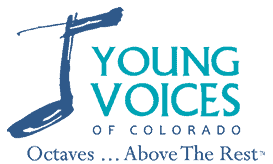 Donations to Young Voices of Colorado help us provide music education to the youth of our community. The funds help sponsor a scholarship program for those in need, allow us to have a robust music library and provide salaries to our talented musical directors and accompanists. We could not manage without the help of our Season Supporters. YES! I want to be a Young Voices of Colorado Season Supporter. My gift will be matched by my/my spouse's company. List the company from which we will receive the gift. Payment Options will show after you have submitted this form. We are always looking from quotes for our supporters. Please give us yours!. Instructions We truly appreciate your contribution to Young Voices of Colorado. Once you have submitted this form you will be directed to the Donation Payment Page. Thank You.